Deadline Extended for Submissions! Please note, the deadline has been extended to January 8, 2012. Papers from interested contributors are welcome. Please send your proposals with the subject title, information about the speaker and a short content description to callforpapers@linuxnewmedia.com. Organized by Linux New Media AG, the Open Source Forum will feature an extensive series of presentations. The call for papers applies to individuals and organizations as well as open source developers. Sought after are practicioners who can report on their experience deploying free software in the corporate sector and in organizations. The focus should be on innovative products, new projects and open source/Linux specific technologies. Of great interest are also projects connected to the CeBIT keynote theme "Managing Trust". The ever so popular series of presentations at Open Source Forum. Interested participants should send their proposals with the subject title, information about the speaker and a short content description to callforpapers@linuxnewmedia.com. Presentations should be approximately 45 minutes in length (including a short Q&A session) and either be in English or German. An international jury of open source experts will choose the successful applications. The Call for Papers ends on Sunday, December 18, 2011. The Open Source Software theme area in Hall 2 includes the Open Source Forum, the Open Source Project Lounge, and the Open Source Park. 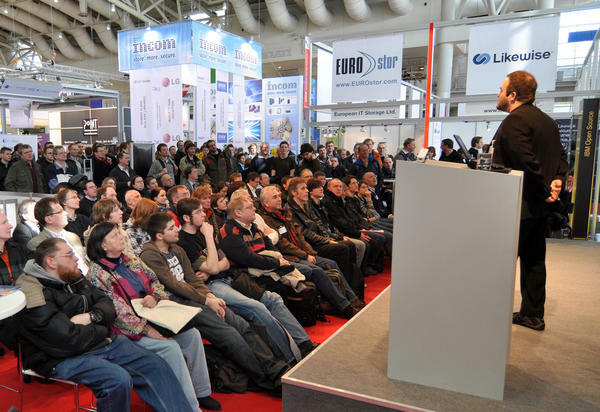 The Project Lounge gives Free Software Projects the opportunity to present their work to the CeBIT audience. The Open Source Park features all things open source/Linux in a joint exhibition. The Forum's entire program will be broadcast through a live stream on Linux Magazine Online and be available for free through the Linux Magazine streaming archive page.